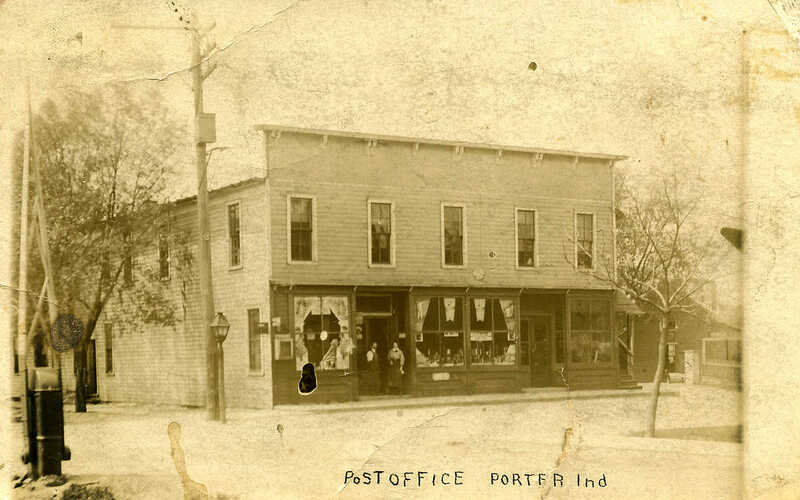 On Sunday, February 27, 1921, at 6:23 pm occurred one of the most tragic accidents in Porter County history, resulting in the death of 37 individuals. 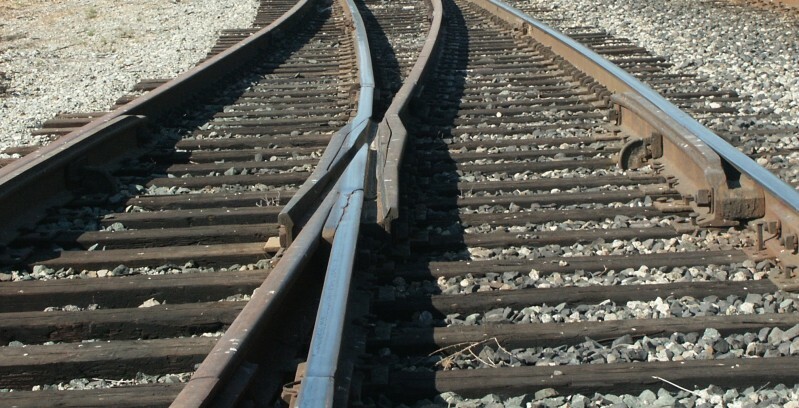 Two other railroad accidents in the county have also resulted in a significant loss of life. Nine to eleven people are believed to have perished on October 11, 1887, when a freight train rammed into the rear of a waiting passenger train on the Chicago & Atlantic Railway near Kouts. 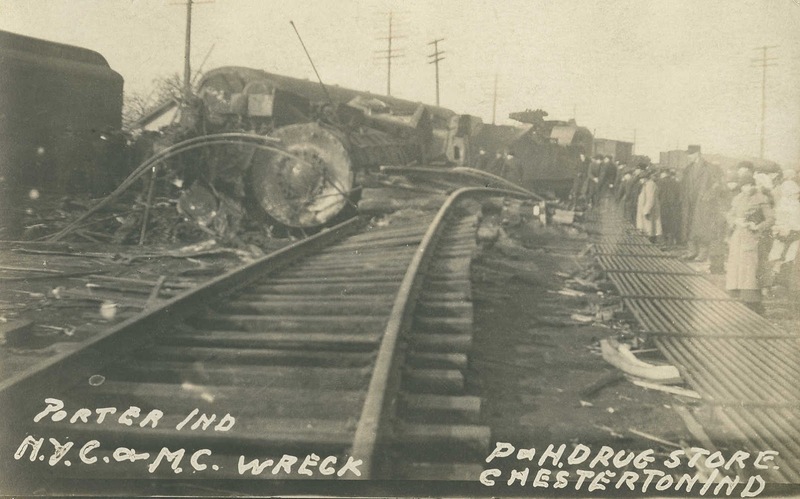 The Woodville wreck on the Baltimore & Ohio Railroad in Liberty Township during the early morning hours of November 6, 1906, is estimated to have killed between 55 to 61 individuals when a a freight train and passenger train crashed head-on during a blinding snowstorm. In both of these disasters, the loss of life was estimated since some passengers' bodies were not recovered due to the complete incineration of their remains immediately following the wrecks. In all three wrecks mentioned, operator error was found to be the primary cause; in other words, all three disasters were avoidable. Weather was also common factor for several early Porter County train related deaths. For example, heavy rains could lead to the undermining and washing out of the railbed. A railbed washout occurred on the Baltimore & Ohio Railroad at Suman in Jackson Township on August 27, 1923, killing one and seriously injuring four. perished in the accident. Four other crew members were seriously injured. Another man killed on the Pan Handle road; this makes 10 that have been killed within one half mile east of Hebron station since the road was built. Benton Brooks was found about 1 o'clock on the morning of the 5th of July badly mangled by being run over by the cars. He went to Chicago on the 4th and came home on the late train and got off with a good many others, seeming to be all right and was not seen again until 1 a. m. next morning, a brakeman was looking for a hot box on one of the cars and found him under the cars badly mangled. He and Smith who died under the influence of chloroform a few days ago tented together in the swamp and both died in a few days of each other. 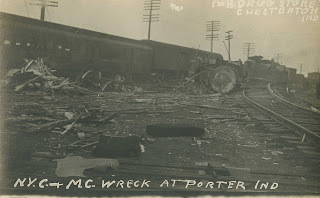 The Porter train wreck of 1921 occurred at a grade level crossing located south of Lincoln Street and west of Wagner Road in Porter where the Michigan Central Railroad and the New York Central Railroad tracks crossed one another at an approximate 45 degree angle. In 1921, both companies had double tracks at this location. The Michigan Central's tracks have since been reconfigured and no longer appear as they did at the time of the wreck. Interestingly, these two railroads had two locations where their tracks crossed before meeting their terminal locations in Chicago. Aside from the Porter crossing, the other was the Grand Crossing (75th Street) in Chicago. Sixty-eight years previously a collision of trains took place at Grand Crossing under nearly identical circumstances as the Porter disaster. 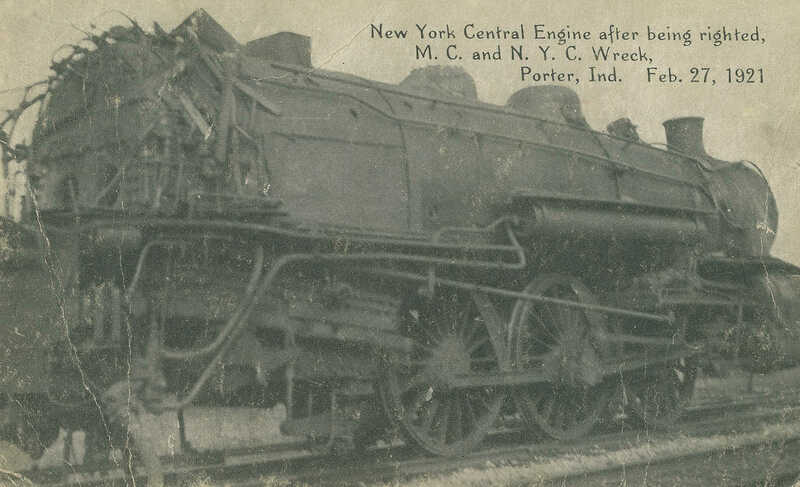 During the evening of April 25, 1853, an eastbound Michigan Central train collided with a train carrying German emigrants operated by the Michigan Southern Railroad, which later came under the ownership of the New York Central Railroad. Investigation found that the Michigan Central engineer failed to observe a stop signal and was running without a headlight. Twenty-one emigrants were killed. As a consequence of this disaster, the Grand Crossing was redesigned to be grade separated. On February 27, 1921, the New York Central was operating westbound train No. 151, known as the Interstate Express, which was due at 7:30 pm in Chicago. The Michigan Central's No. 20, known as the Canadian and operated by engine 8306, had left Chicago at 5:05 pm and was bound for Detroit and Toronto. Given the nature of the crossing at Porter, adequate safety equipment and precautions were in place to avoid collisions. Both tracks included block signals that were interlocked with derails that were controlled from the signal tower at the crossing. An interlock is similar in concept to a traffic light whereby red in one direction means that the cross direction is green. Thus, one train must stop as the other is provided the right-of-way through the crossing. As the trains approached the crossing, the New York Central's engine 4828 triggered the signal circuit first. Consequently, a bell rang in the signal tower to alert the telegraph operator, Charlie Whitehead, to line up the route for the New York Central train. When Whitehead activated the system for the New York Central train, a signal was automatically sent to force the Michigan Central train to yield. 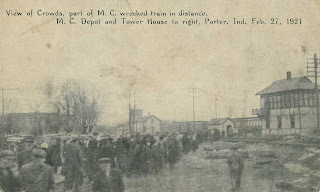 As the Michigan Central train approached Porter, both the engineer and fireman, William S. Long and George F. Block, respectively, observed the signal located about one mile from the crossing, referred to as a distant signal, stood at caution; a caution signal informed the engineer that the home signal was in the stop position. Accordingly, Engineer Long slowed his train to ten miles per hour as it approached the Porter crossing and was preparing for a complete halt should the home signal remain in the stop position. The home signal near the crossing was situated along a slight curve along the Michigan Central track. Upon reaching the home signal, Fireman Block called out "All the way." This advised Engineer Long that the signal was indicating clear. Following protocol, Engineer Long released the brakes and increased steam though he had not visibly confirmed the clear signal himself. Engineer Long later testified during the crash investigation that immediately after releasing the brakes and putting on steam he thought he had observed the home signal to be in the "three position," meaning that the upper quadrant of the semaphore blade was at clear. Hence, Engineer Long believed that he could safely proceed through the crossing at Porter. I saw right away what was going to happen and thought that the tower would be demolished. I called to Charlie Whitehead, the telegraph operator in the tower with me, and made for the steps which led to the ground. Neither Whitehead nor Cook were able to make it out of the signal tower prior to the collision, but both escaped without injury. April 21, 1981. 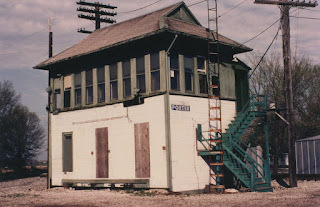 The signal tower was later razed. Source: Collection of Dennis Schmidt. Engineer Long reportedly looked again to be certain that the home signal was at the clear position. A Michigan Central freight train, however, was situated on an adjacent siding and the smoke from this train cloaked the signal from his view. Two brakemen on the Michigan Central freight train observed that the home signal was at the stop position and that Engineer Long's train did not appear to be slowing down, but rather the train was increasing speed. Therefore, they frantically waved their hand lanterns to signal Long's train to stop. Fireman Block testified he proceeded to shovel coal as the train passed the home signal. Approximately 300 feet before the crossing, at a speed that investigators estimated to be between 35 and 55 miles per hour, Engineer Long suddenly realized that something was wrong when his train ran off the track at the derail. This safety mechanism forced the Michigan Central engine off the rails, followed by its passenger cars, and onto the ties and railbed. The ultimate purpose of this derail was to stop a train before it reached the crossing. The Michigan Central train was traveling too fast. 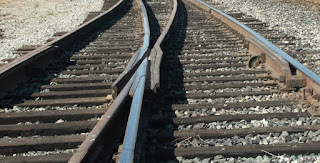 When the engine came to the crossing of the Michigan Central and New York Central tracks, it hit the frog, also referred to as a common crossing rail device. Astonishingly, the frog caused the engine to rerail itself onto the track where it traveled another 400 feet beyond the crossing before coming to a complete stop. The cars behind the Michigan Central engine failed to rerail, but they remained upright and were aligned along the Michigan Central track directly in front of the Porter signal tower. An example of a frog crossing or common crossing device. The first passenger coach behind the Michigan Central engine and tender came to rest at the crossing with the New York Central track. At nearly the instant that the Michigan Central train had stopped, the New York Central's Interstate Express, traveling westward at about 50 miles per hour, completely demolished the Michigan Central's first passenger car. The wooden passenger car was thrown over 75 feet and was splintered to pieces creating a large debris field. The sudden and violent impact killed 35 passengers on the Michigan Central train, as well as the two-man engine crew of the New York Central train. 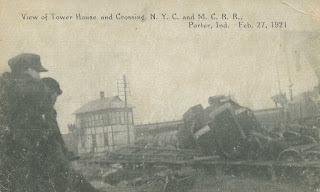 Upon ramming into the Michigan Central's passenger coach, the engine of the New York Central train left the track in a northwesterly direction in front of the Porter signal tower. Debris damaged the first floor of the signal tower and the New York Central engine created a hole 10 feet deep into the ground immediately west of the signal tower. 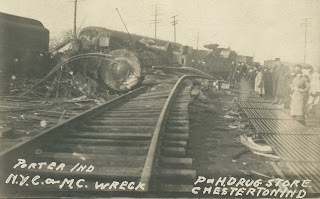 Central Railroad trains immediately prior to colliding on February 27, 1921. The official investigation into the accident found that the New York Central train was first in activating the annunciator in the Porter signal tower though the Michigan Central train obviously reached the crossing first. However, the distant signal on the New York Central tracks was approximately 1,000 feet farther away from the crossing than the distant signal of the Michigan Central line. Hence, both trains were almost the exact same distance from the crossing when the New York Central train activated the annunciator. Railway tracks at the Porter signal tower, July 11, 1906. The investigation concluded that the New York Central train was traveling at a consistent speed of 50 miles per hour and the Michigan Central train, after initially slowing down, had increased its speed past 50 miles per hour since it arrived at the crossing first. The Michigan Central crew, therefore, violated company rules that stipulated speeds in excess of 40 miles per hour were prohibited at this particular location along the railroad. The accident investigation also concluded that, without any doubt, the home signal was in the stop position and that Engineer Long and Fireman Block misread it. 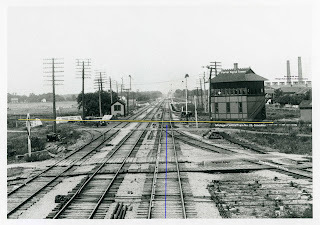 Long initially testified that he could not view the home signal since it was obscured by the smoke from the Michigan Central freight train on the side track; he later testified that he confused the order board that was located past the crossing in front of the tower with the home signal. Both of Engineer Long's explanations were plausible, but he was not exonerated for causing the wreck. 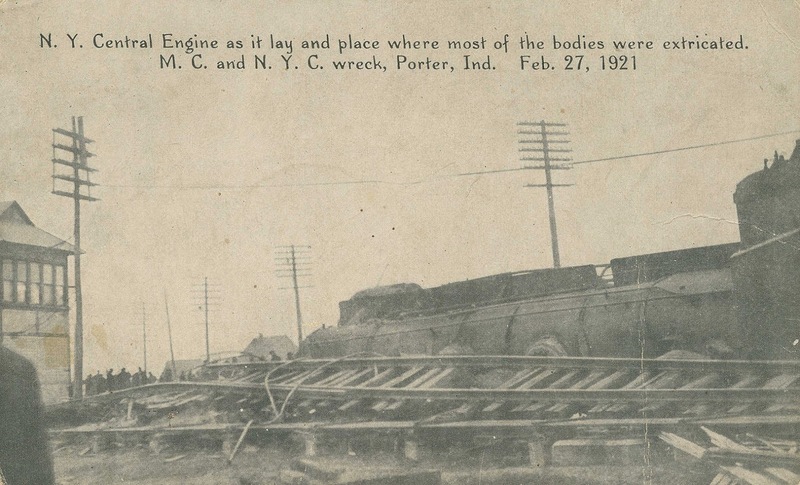 bodies were extricated from the Porter train wreck of February 27, 1921. The roar of the impact was heard across much of Porter and Chesterton, and almost immediately emergency whistles and fire bells were sounding the alarm; more than 100 people were on the scene to offer assistance, including uninjured passengers on both wrecked trains. Newspaper columns reported that the noise at the scene from the steam escaping from the engines was so loud that no sounds could be heard for the first several minutes after the accident. 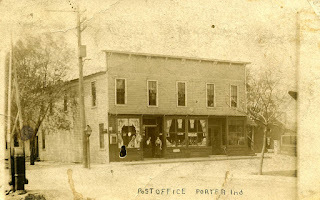 Porter, Indiana, on February 27, 1921. The first I knew of the impending catastrophe was the terrible sound caused by the air brakes of the Michigan Central train. I glanced up to see it bumping over the ties after it left the derail. I happened to glance in the other direction and was horrified to see the New York Central train coming down the track at terrific speed. I watched, fascinated, unable to move, as the disaster worked itself out before me. There was a tremendous crash. Splinters flew in all directions. Then the scene was obliterated by a cloud of dust and cinders. Both telephone and telegraph messages were promptly sent to request help. Relief, salvage, and wreckage crane trains were at once dispatched from LaPorte, Gary, Michigan City, and Chicago, the first arriving on the scene being a relief train with doctors and nurses from Michigan City at 7:10 pm. It took 23 hours to clear and repair the tracks, with an eastbound Michigan Central train being the first train to pass through at 5:20 pm on February 28. 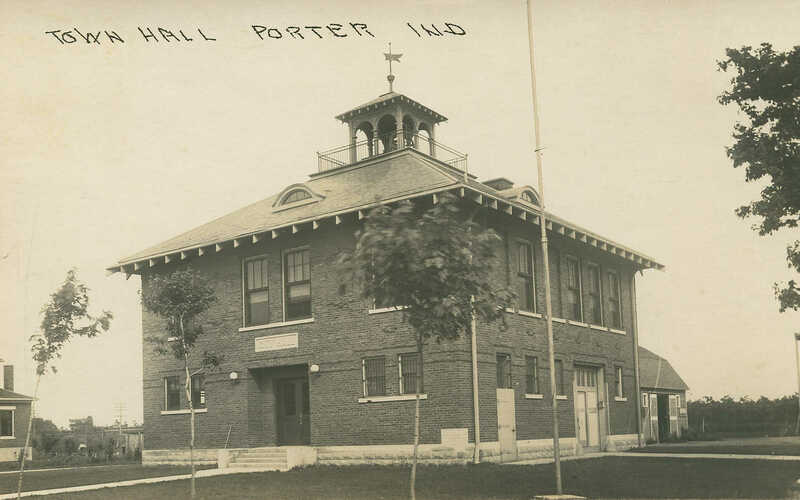 Given the enormous number of casualties, the rail depot, as well as the Porter Town Hall and town post office were converted into temporary hospitals and morgues. Some casualties found to be terribly mangled and in critical condition were also removed to an undertaker establishment in Chesterton for treatment. The Porter Fire Department hooked up their hoses to hydrants near the post office and extinguished all flames. The salvage train crews worked overnight to lift and remove the twisted cars, which allowed for the extrication of numerous victims. injured in the February 27, 1921, train wreck. 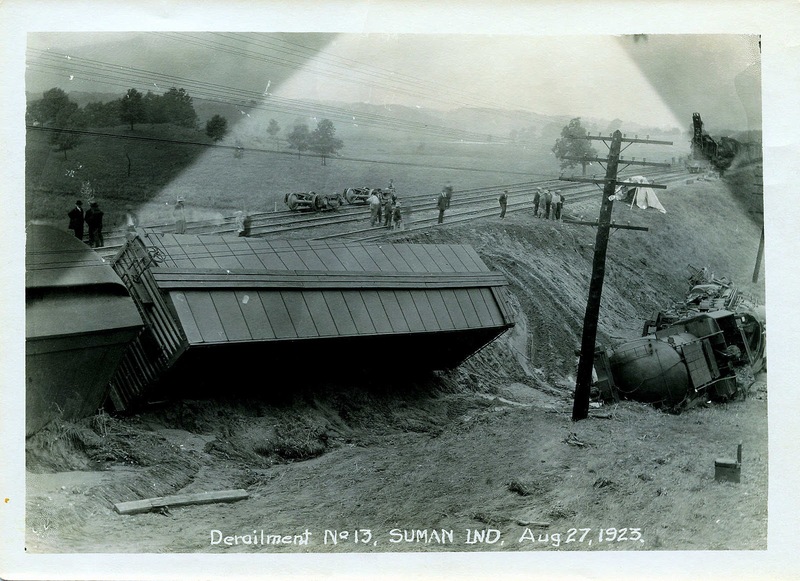 February 27, 1921, train wreck. One peculiarity of the accident is that those killed were mostly decapitated, a number being mutilated so badly that identification was next to impossible. The Chesterton Tribune printed the names and hometowns of the 37 individuals that perished in the disaster, as provided below. Note that the spelling of names have been corrected using cemetery and death certificate information. Roads leading to Chesterton contained one long stream of automobiles. Machines were parked in the streets adjacent to the scene of the wreck for blocks around. People walked, they came in buggies, in wagons, on bicycles, on interurban cars, and on railroads. tower is visible to the right in this image. 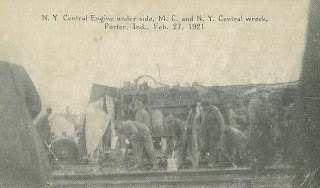 In the matter of the unfortunate collision at the crossing of the New York Central and Michigan Central railroads at Porter, Indiana, Sunday February 27, 1921, of New York Central Train 151 and Michigan Central 20, after a careful investigation of the facts with all interested employees and conference with officials just completed, it has been determined that engineer, William S. Long and fireman George F. Block on engine 8306, train 20, violated rules and regulations in failing to observe and properly obey signal indications and will forthwith be dismissed from service. The Interstate Commerce Commission's Bureau of Safety in Washington, D.C. issued a report on March 21, 1921, that came to the same conclusion announced by Henry Schearer of the Michigan Central Railroad. The report found fault in Engineer Long who failed to observe and obey track signals, and in Fireman Block who also failed in properly identifying the signal and conveying the correct information to his engineer. 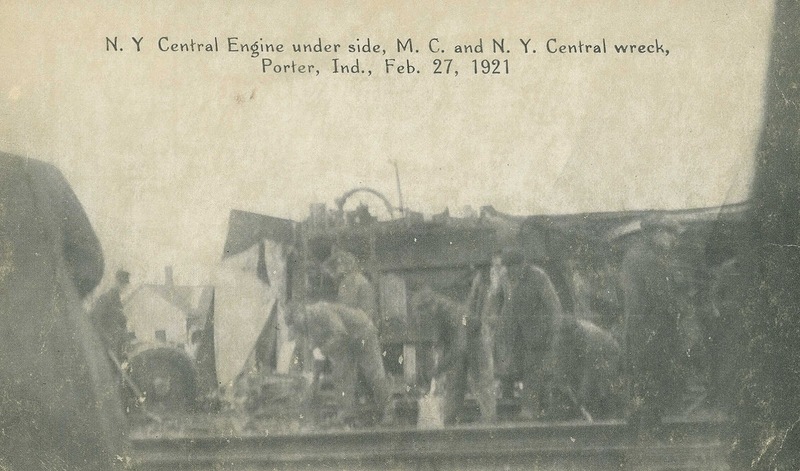 engine involved in the Porter train wreck of February 27, 1921.
involved in the Porter train wreck of February 27, 1921. The accident again called attention to the necessity for an automatic train control device to be used in connection with existing signal equipment for the purpose of automatically controlling the speed of a train in case the engineman for any reason fails properly to observe signal indications and to operate his train accordingly. The Bureau's report was consistent with numerous newspaper editorials that declared that the accident at Porter was inevitable given that it was a grade level crossing of tracks of two separate railroad companies. Although Engineer Long and Fireman Block were ultimately blamed for the accident, newspaper accounts were not particularly critical of them given the nature of the crossing. 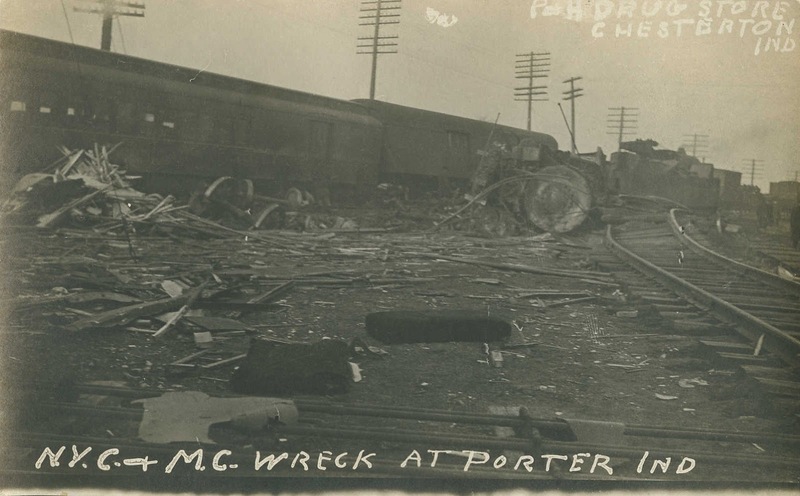 Remarkably, the 1921 crash at Porter was the last major grade crossing collision involving two trains.The development and adoption of various automation technologies, equipment, and more stringent regulations has made this type of railroad accident completely avoidable. at the Porter train wreck of February 27, 1921.
and crowds gathered at the Porter train wreck of February 27, 1921.
from the Porter train wreck of February 27, 1921. The Bureau of Safety also included information in their report concerning the service of Engineer William S. Long and Fireman George F. Block. October, 1901, suspended 10 days for running off interlocking signals against him. September, 1907, suspended 10 days for failure to stop for telegraph signal not burning. December, 1907, suspended 10 days for failure to stop for block signal not burning. February, 1909, taken out of service on account of defective vision. June, 1909, restored to service on account of improved vision. April 1, 1914, observed surprise test; light out on telegraph signal. 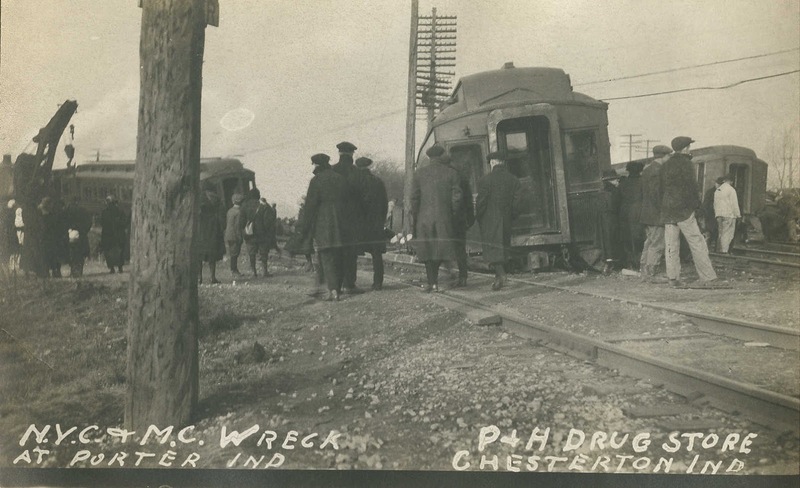 April 28, 1918, record suspension 30 days; collided with caboose car, flag out. Fireman Block had entered the service of the Michigan Central Railroad in December 1915 and was promoted to Road Fireman in February 1916. Block then left the company to serve in the military from May 1916 to January 1919. He returned to work for the Michigan Central and was promoted to switch engineman in March 1920. Block had a single entry on his service record, as follows. April, 1919, given suspended sentence of 30 days, which was later modified to reprimand, for disregarding fixed signal in stop indication. Anonymous. 1921. 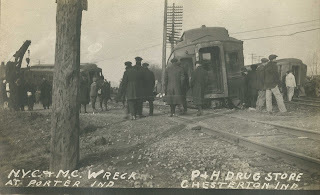 Disastrous Collision Wreck at Porter, Indiana. Railway Review 10(68):347-349. Anonymous. 1921. Obituaries. The Railway Clerk 20(4):188. Anonymous. 1921. Railroads Cause Many Fatalities: More Than One Thousand Persons Killed in Wrecks or by Trains Last Year. The Spectator: A Weekly Review of Insurance 106(10)3-4. Anonymous. 1921. Safety First: The Porter (Ind.) Wreck - Michigan Central Engine Crew Must Have a Square Deal. Brotherhood of Locomotive Firemen and Enginemen's Magazine 70(6):19-20. Anonymous. 1921. 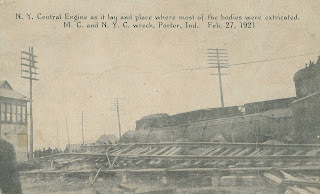 Unusual Accident Happens on Interlocking: New York Central Train Ploughs Through Coach of Michigan Central Train, Resulting in Many Fatalities. Railway Signal Engineer 14(1):88-90. The Tribune, Chesterton, Porter County, Indiana; July 12, 1888; Volume 5, Number 13, Page 1, Column 5. Column titled "Hebron." The Chesterton Tribune, Chesterton, Porter County, Indiana; March 3, 1921; Volume 37, Number 51, Page 1, Columns 1-3, and Page 8, Columns 1-5. Column titled "Will Fix Wreck Blame: Board of Inquiry to Determine the Cause of Wreck Which Kills 37." The Chesterton Tribune, Chesterton, Porter County, Indiana; March 3, 1921; Volume 37, Number 51, Page 1, Column 4, and Page 5, Column 5. Column titled "Thousands of Persons Come to See Wreck." The Chesterton Tribune, Chesterton, Porter County, Indiana; March 3, 1921; Volume 37, Number 51, Page 1, Column 5. Column titled "The Dead." The Chesterton Tribune, Chesterton, Porter County, Indiana; March 3, 1921; Volume 37, Number 51, Page 1, Column 6, and Page 4, Column 5. Column titled "People of Community at Wreck." The Chesterton Tribune, Chesterton, Porter County, Indiana; March 3, 1921; Volume 37, Number 51, Page 4, Column 1. 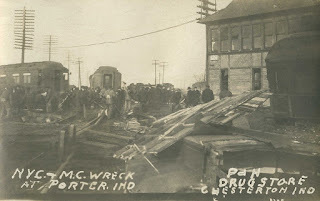 Column titled "The Wreck at Porter." The Chesterton Tribune, Chesterton, Porter County, Indiana; March 3, 1921; Volume 37, Number 51, Page 4, Column 2. Column titled "Eye Witnesses Tell Story of the Disaster." The Chesterton Tribune, Chesterton, Porter County, Indiana; March 3, 1921; Volume 37, Number 51, Page 5, Column 3. Column titled "Undertakers, Not Doctors and Nurses Needed." The Chesterton Tribune, Chesterton, Porter County, Indiana; March 3, 1921; Volume 37, Number 51, Page 5, Column 6. Column titled "Toll Includes Three Children Who Are Killed." The Chesterton Tribune, Chesterton, Porter County, Indiana; March 10, 1921; Volume 37, Number 52, Page 1, Columns 3-4. Column titled "State Acts to Obtain the Facts." The Chesterton Tribune, Chesterton, Porter County, Indiana; March 10, 1921; Volume 37, Number 52, Page 1, Columns 5-6, and Page 5, Column 4. Column titled "Engineer and Fireman Held on Manslaughter Charge by Coroner." The Chesterton Tribune, Chesterton, Porter County, Indiana; August 30, 1923; Volume 40, Number 25, Page 1, Column 6. Column titled "Engineer Killed in Wreck Caused by Washout." The Chesterton Tribune, Chesterton, Porter County, Indiana; March 1, 1996; Page 12, Column 1-3. Column titled "75 Years Ago Porter Train Wreck Shocked the Community," by Bob Kasarda. in the 1920's and 1930's. This is also very well written document.